وجه العملة صورة لشيووو تشيونوانج وهو يمتطي حصانه وعبارة "شيووو تشيونوانج"
صورة لشيووو تشيونوانج وهو يمتطي حصانه وعبارة "شيووو تشيونوانج"
1/10 أوقية 2017 قطعة ذهبية (Black Assay) لشيوو تشيونوانج كوريا الجنوبية Purchase your 1/10 oz 2017 South Korean Chiwoo Cheonwang gold round from our store today and enjoy the lowest price online. This gold coin marks the first ever release of a 1/10 gold medallion by the South Korean mint (KOMSCO) and forms part of an acclaimed series, celebrating the ancient Korean and Chinese legend of a military leader turned war-god and guardian, Chiwoo Cheonwang. The reverse of this .999 fine gold round features a dynamic rendition of the legend at his most fearsome, astride his warhorse, shield and weapon in hand as he goes in for the kill. Aside from a simple frame and minimalist field, only the name, ‘Chiwoo Cheonwang’ joins this intricately detailed artwork on the reverse. The obverse of the medallion features a closer look at the character’s marvelously ferocious battle shield, which boasts a meticulously engraved image of the war-mask the legend would wear into battle. Also on the obverse, you’ll see the year of issue and purity, as well as the KOMSCO stamp, the country of origin and the ‘1 Clay’ denomination. Your order will be encased in a striking black assay card, also featuring the trademark armored mask design, which has been an object of veneration since Chiwoo Cheonwang was first worshiped by the original Chinese Emperor, Qin Shi Huang. 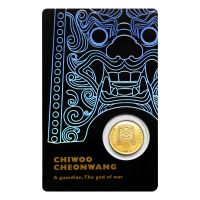 Fortify your holdings with the armor of the ancient gods, when you order your 1/10 oz 2017 South Korean Chiwoo Cheonwang gold round today.